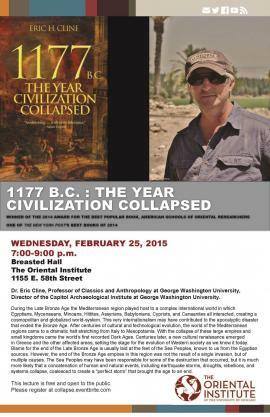 On February 25, 2015, Professor Eric Cline (The George Washington University) delivered a lecture at The Oriental Institute, University of Chicago, on the collapse of civilization at the end of the Late Bronze Age. The lecture was on the same subject as his recent book, 1177 B.C. : The Year Civilization Collapsed (2014). For more than three hundred years during the Late Bronze Age, from about 1500 BC to 1200 BC, the Mediterranean region played host to a complex international world in which Egyptians, Mycenaeans, Minoans, Hittites, Assyrians, Babylonians, Cypriots, and Canaanites all interacted, creating a cosmopolitan and globalized world-system such as has only rarely been seen before the current day. It may have been this very internationalism that contributed to the apocalyptic disaster that ended the Bronze Age. When the end came, as it did after centuries of cultural and technological evolution, the civilized and international world of the Mediterranean regions came to a dramatic halt in a vast area stretching from Greece and Italy in the west to Egypt, Canaan, and Mesopotamia in the east. Large empires and small kingdoms, that had taken centuries to evolve, collapsed rapidly. With their end came the world’s first recorded Dark Ages. It was not until centuries later that a new cultural renaissance emerged in Greece and the other affected areas, setting the stage for the evolution of Western society as we know it today. Blame for the end of the Late Bronze Age is usually laid squarely at the feet of the so-called Sea Peoples, known to us from the records of the Egyptian pharaohs Merneptah and Ramses III. However, as was the case with the fall of the Roman Empire, the end of the Bronze Age empires in this region was not the result of a single invasion, but of multiple causes. The Sea Peoples may well have been responsible for some of the destruction that occurred at the end of the Late Bronze Age, but it is much more likely that a concatenation of events, both human and natural — including earthquake storms, droughts, rebellions, and systems collapse — coalesced to create a “perfect storm” that brought the age to an end. Professor Christopher B. Hays (Fuller Theological Seminary) delivered a lecture at the College de France, on April 15, 2016, entitled, “Imagery of Divine Suckling in the Hebrew Bible and the Ancient Near East“. The video may be downloaded or watched online in mp4 format. In the latest episode of Emory Looks at Hollywood series, Jacob L. Wright, Associate Professor of Hebrew Bible at Emory’s Candler School of Theology, discusses the various Flood traditions which lie behind and within, and which were inspired by the biblical Flood story, including one of the most recent developments in the unfolding tradition, Darren Aronofsky’s film Noah (2014). Wright also has a short article on the same subject in Sacred Matters, “Noah: An Unrighteous Man”. In two videos of a talk delivered at UC Irvine on 29 November 2012, Prof. Bruce Lincoln examines the evidence for the identification of the Magi, a term strangely bifurcated between somewhat positive and very negative meanings. Videos of Thomas Römer’s 2013 seminars at the Collège de France, entitled The Human Condition: The Ancient Near East and the Hebrew Bible, are available at the Collège’s website, or for download at the links provided below (800mb+). The seminars have been overdubbed by an English translator. Thomas Römer is Professor of Old Testament at the University of Lausanne (UNIL) and the Collège de France, and author of many works, including Israels Väter (1990) on the Patriarchal traditions in the Pentateuch. In these seminars, Römer discusses the question of the human condition, drawing on ancient Near Eastern texts such as the Epic of Gilgamesh and, especially, on biblical texts. Man “Image of God” or “Sinner From The Very Beginning”? Individual Death and the End of the World – Is Man Able to Imagine an Absolute End?